Honouring the 150th anniversary of the composer’s death, Berlioz: The Complete Works is the first-ever complete Hector Berlioz edition. The collection features milestone recordings selected from over 60 years of the Warner Classics, Erato, and Universal catalogues, including a number of world premiere recordings. Conceived in partnership with the Hector Berlioz Museum and Hector Berlioz Festival, this landmark boxed set will be an official product for France’s Berlioz Year (2019). Hector Berlioz, France’s greatest Romantic composer, died in Paris on 8 March 1869. 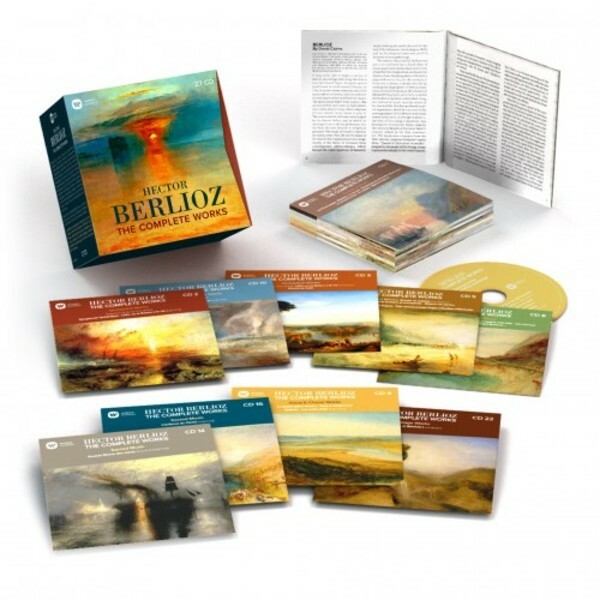 Warner Classics is marking the 150th anniversary of his death with the release of the first-ever complete Berlioz edition, a 27-CD box set of his works. Looking to repeat the success of Warner Classics’ complete Debussy edition, released in 2017, the set becomes available in physical and digital formats on 1 February 2019. Hector Berlioz: The Complete Works contains a wealth of milestone recordings. Carefully selected from the Warner Classics and Erato catalogues with some additions from Decca and Deutsche Grammophon, they span more than 60 years, from 1956 to 2018. Among them are: the multi-award winning 2017 recording of Les Troyens conducted by John Nelson; the Symphonie fantastique and Lélio conducted by Jean Martinon; Janet Baker singing Les Nuits d’été conducted by Sir John Barbirolli, and L’Enfance du Christ conducted by John Eliot Gardiner. The edition also contains a number of world premiere recordings, most notably the surviving fragments of the unfinished opera La Nonne sanglante. Featuring leading French soprano Véronique Gens, these were recorded at their world premiere performance at the 2018 Berlioz Festival in La Côte-Saint-André, near Lyon. The edition offers a special bonus in the form of the two earliest recordings of Berlioz’s music, produced by Pathé at the beginning of 20th century: two of Didon’s arias from Les Troyens are sung by Marie Delna and Félia Litvinne, and for the very first time on CD the first ever recording of the Symphonie fantastique under Rhené-Baton’s baton, recorded in 1923. Berlioz was born in La Côte-Saint-André in 1803. The town’s Hector Berlioz Museum, an official partner in Hector Berlioz: The Complete Works, has supplied numerous documents and images for the lavish 160-page booklet. Along with material from France’s Bibliothèque Nationale, they complement fascinating notes by David Cairns – perhaps the world’s leading authority on Berlioz. France’s Ministry of Culture has honoured the edition with inclusion in its official schedule for Berlioz Year 2019. Berlioz is the epitome of the Romantic composer, exemplifying the spirit which dominated the artistic world in the 19th century. He led an unconventional, hectic life, driven by his passions, and was an avid admirer of Beethoven, the father of Romanticism in music, and of such influential literary figures as Shakespeare, Goethe, Walter Scott, Lord Byron and Victor Hugo. Much of his music has an autobiographical element; his most famous work, the Symphonie fantastique (1830) was inspired by his obsessive love for the British actress Harriet Smithson, whom he eventually married. His works are astonishing for their ambition, originality and colour. He was a transformative force in orchestration and often used huge forces – such as 16 timpani in his Grande Messe des Morts and six harps in Les Troyens. While each of his major works has a distinctive poetry and atmosphere, it is perhaps Les Troyens, an opera of epic proportions, that best sums up his richly diverse artistic personality. In some senses ahead of its time, Berlioz’s g enius was only fully understood after his death. The works of a similarly imaginative and innovative artist, the British painter J.M.W. Turner (1775-1851), have been chosen as cover art for Hector Berlioz: The Complete Works. With their colour, splendour and expressive power, they provide an ideal visual analogue to Berlioz’s music.